Made with smooth, reinforced plastic slats the Savanah bath board provides a strong comfortable, quick draining design and is available with or without handle. The slats are fully sealed against the ingress of water and all fittings are stainless steel, giving a corrosion resistant bath board. The brackets include a serrated face and rubber buffers to help secure the board in place. 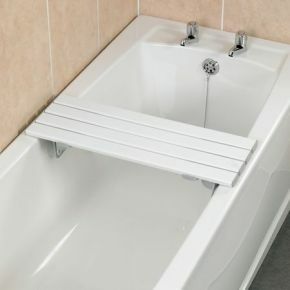 The bracket may also be angled to position the board further back into the bath. 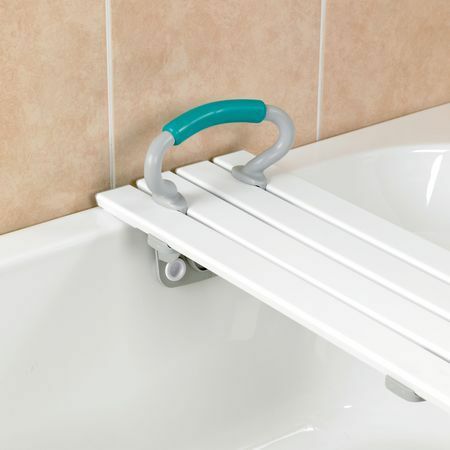 Rubber pads under the slats help prevent the bath board slipping on the rim of the bath. Please note that an optional handle is available if required. excellent product strong but lightweight ,easy to fit and remove , protective ends to avoid bath side scratching. No balancing on one leg trying to wash your feet. Suburb. The bench fits perfectly and was promptly delivered.